I have been interested in woodworking and furniture design since 1994, when my father and I began building small projects in the family garage. (Our first project was a working, scale-model guillotine.) We quickly outgrew the space, and moved into a warehouse in Houston’s Montrose district. I received a Bachelor of Arts in Studio Arts from the University of Virginia in 2003. After a brief stint as a designer and draftsman for a Houston-based offshore engineering firm, I decided to pursue furniture making as a full-time profession, and enrolled in the Center for Furniture Craftsmanship’s inaugural Nine-Month Comprehensive program. After graduating from CFC, I returned home to open my own shop in Houston. After spending two years building strictly commissioned work, I applied to the Fine Woodworking Program founded by James Krenov in Fort Bragg, California. There I learned to balance handwork and fine detailing with the production methods I learned in Maine. In 2009 I was given the opportunity to study lettercarving with master carver Chris Pye. I was hooked from my first serif, and I have been carving letters on commission and on spec ever since. My work has appeared in Fine Woodworking, Fine Homebuilding, Woodworker West, and Letter Arts Review; and I have exhibited on all three coasts. In 2010, I was delighted and honored to received an Award of Merit for my cypress Garden Bench in the biennial CraftTexas show at the Houston Center for Contemporary Craft. I build furniture because I love the challenge of working with wood. My hope with any piece I make is to make it the very best piece it knows how to be; to instill it with a feeling and mood suitable to its function and setting. My goal is to make pieces that know what they want to be when they grow up. 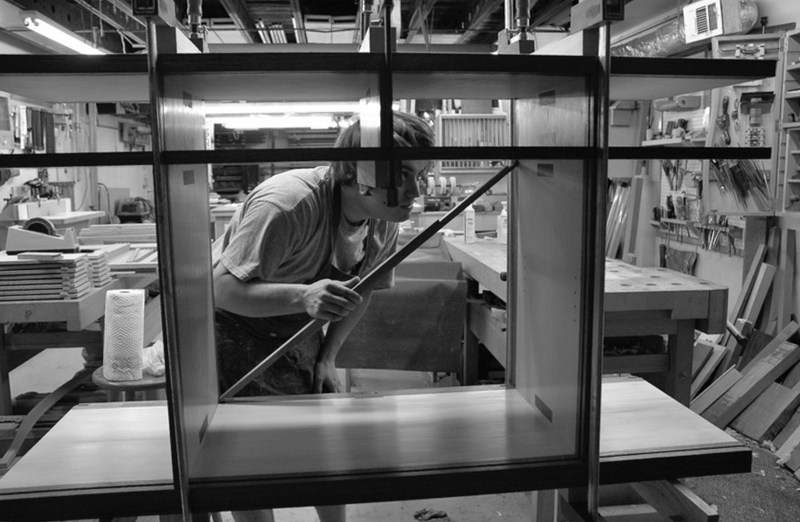 Work that is what it is; no more, no less.These days I am happy to split my time between building commissioned furniture and spending time with my wonderful family.Every day in the shop is an adventure, and I hope to never stop learning this craft. Wonderful! I cannot recommend such an endeavor highly enough. (Although I am not entirely unbiased in this regard.) So what happens next? Generally, after the basic premise and budget of a piece are sorted out via phone or email, I will meet with clients here at the shop to discuss wood selection and sketch out a few ideas. If all seems well I will put together either a drawing or a full-scale mockup, along with a formal proposal for client approval. Upon approval I will ask for a 25% deposit to purchase materials, with the balance being due upon delivery. Please note that lead times for a piece are generally around six months to a year, so please plan accordingly. Can you use a cheaper wood? The short answer is yes, I could...but I would rather not. The reason for this is that most of the cost of a piece is in the labor, not the materials. In other words, for the most part the difference between using an inexpensive wood and something more "exotic" will have a relatively small impact on the final price of a piece. Therefore, what I tell clients is to pick the wood that they want. Find something that speaks to them. Maybe it's the elegance of walnut, or the classic look of cherry, or just the comfortable warmth of white oak; the wood you pick is as much a personal choice as the clothes you wear. HOW MUCH SHOULD I BUDGET FOR MY PIECE? Every project is different; therefore I don’t have a list of prices or “standard” pieces. Generally, prices start around $3,000 for smaller pieces such as boxes or side tables, and can run up to $30,000 for large-scale, complex work such as a dining table or a run of chairs. These are, of course, fairly broad estimates - I am happy to work with you to find a piece that will fit your budget.